I came to this project from a technical background. 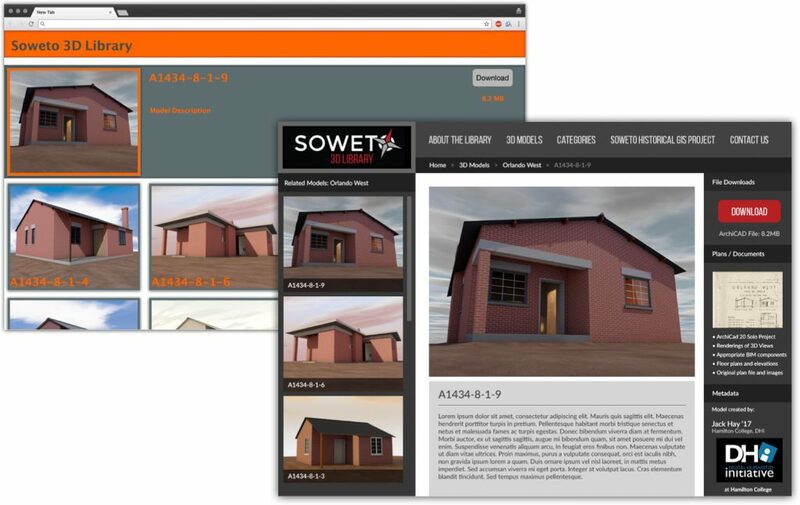 I am a 3D designer and a software engineer but my work on this project has led me from the safe confines of Computer Aided Design into the deep and troubling history of “native housing” on a large scale during apartheid. It is the design of these houses that gives the project clarity as these rudimentary and hastily wrought plans constantly remind one of their legacy. My experience in architectural design software when I joined this project had been centered around upscale homes with the luxuries of sustainable design and other costly construction, but these were no shingle-style summer homes on the ocean. In Soweto the floors were often packed earth and the furnishings simple and industrial. Open space was provided for in neighborhood plans to accommodate the military for crowd control. My work on this project began with the process of modeling these simple township houses using ARCHICAD. ARCHICAD is an industry-grade architectural software that I had experienced while working for an architect close to home. I have also had experience with a number of CAD tools in the past. After speaking with Professor Nieves about the project I decided that the ARCHICAD toolset and out-of-the-box photo-rendering options would be a good infrastructure to model with. As I completed each model, I would add more and more detail; bringing complexity and specificity to the industrial building materials. I used complex profiles to model components in a 2D view before extruding them into the 3rd plane. I also took advantage of the rendering engine to generate images that added realism to the models for presentation. The destination and use of these models is still being defined. My goals for work over the summer include creating a larger 3D model to present the individual models in a realistic setting and configuration, an ARCHICAD-centered video tutorial series, and an online 3D library. Meanwhile, my daytime job this summer consists of work in cloud infrastructure and software development at EBSCO Information Services where I hope to bring some level of experience to the process of building a database from the ground up. If you are interested in the 3D modeling side of the project, I urge you to watch my DHi intern’s presentation (~30 mins) which covers the breadth and depth of 3D work on the project. I also hope to release a video series that covers the tools and techniques that I use which will be available on the DHi website. This will cover the technical elements of ARCHICAD and the process of drafting from planning to completion. I hope to document my experiences with the larger visualization and the library as well. This post arrives early in the evolution of this project. Drafting a 3D model in powerful architecture software is the easy part.